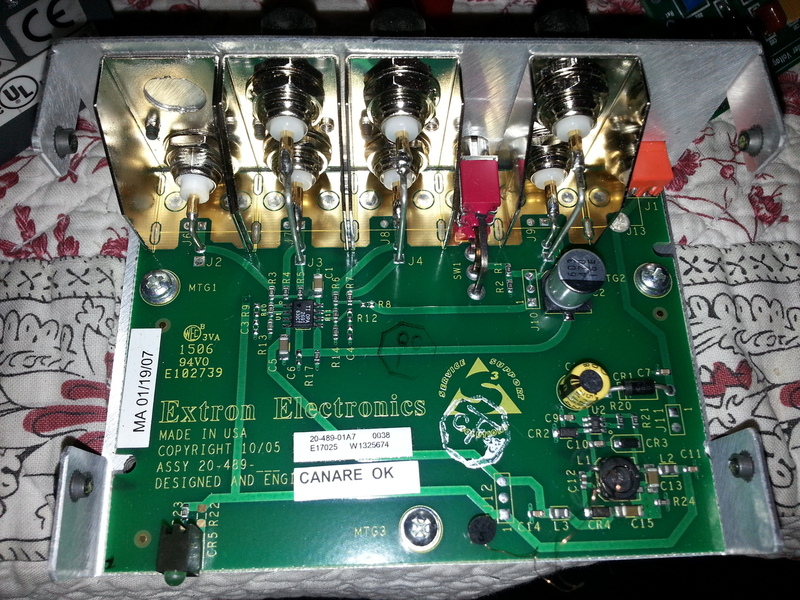 I thought I would post my conversion of an old video distribution amp to a frequency standard distribution amp. The unit in question is an Extron Versa Tools MDA 5V (The "5"" is for five outputs. The "V" is Video, not volts). It is powered by a 12V source. IF ANYONE KNOW WHAT THAT POWER CONNECTOR IS (see pics) PLEASE LET ME KNOW, AS I WANT TO GET ONE. I paid around $17 delivered on ePay for this. Not a bad deal vs. building one from scratch. It has a pretty fast opamp Ti2691 (datasheet http://www.ti.com/lit/ds/symlink/opa2691.pdf ). It already has the BNC connectors, and a case. This unit has a switch to switch between 75 Ohm and High Z for the input. This is a nice feature. It is basically a termination switch. I wanted to use it to distribute a 10MHz frequency reference. As most of you likely know, composite video uses 75 Ohm transmission lines and 75 Ohm terminators at either end. For test equipment you typically want a 50 Ohm termination at each end, using 50 Ohm transmission lines. So I needed to replace the 75 Ohm resistors with 50 Ohm resistors. I cracked this guy open and located the 75 Ohm resistor on the input R1. I also located the output 75 Ohm resistors R3, R4, R5, R6, R7 (Nice low numbers ). Two output lines of the OpAmp are used-- one with three outputs from it (R3,R4,R5) , the other with two outputs from it (R6,R7). Each output port has its own output resistor, though. All these resistors were 1206 0402 ? package SMD resistors, which are really fricking small. I did not have any of these resistors, and was too lazy to go to the store. So I wired it up with big through-hole resistors. I used pairs of 100 Ohms to make 50 Ohms, rather than using 47 Ohms (which would likely have been fine). You can see from the pics that I soldered down a piece of resistor lead to the existing pads on each side. I then soldered my big through hole resistors to these pins (using a heat sink so they did not come off the board). For the pair replacing R1 (by the switch) I found an unpopulated through-hole in line with one of the pads and ended up using it. I then soldered the other ends directly to the switch. So now the switch switches between no termination on the input and 50 Ohm termination on the input. The astute viewer may see the pads for R8. These were unpopulated, and unconnected at the other end of the trace. So I let my wire touch these with wild abandon. I am sure the RF engineers are screaming at their computers right now. given my rather hacky technique. Since I was really only worried about the 10 MHz, and I do not work with higher frequency stuff much (other than radio repair) I was not too worried. Also, all outputs have the same signal anyway. It looks like the original design did not match trace lengths for the various outputs, as it probably did not matter. My question to RF engineers. How much of an impact does wiring it like this have? I am assuming it is better to have the wires down on the board, close to the ground plane backing? Short of using SMD resistors, what other ways might you do this to improvement RF performance? Thanks. Pics, after waiting the silly 60 secs to post again... Since everybody posts pics like this perhaps more and larger pics should be allowed per post?? Works a treat. The phase shift is exacerbated by differing cable lengths. This scope capture shows the 10MHz input wave, and output from three of the ports stacked. The other two outputs work as well. In general you do not need to post images at high resolutions to get the message across to readers. Any areas of specific interest can be posted at a higher resolution. I post pictures at 640x480 as you can get quite a few on each post. At least six IIRC. Sorry, I'm just here to chuckle at your description of 1206 as 'really fricking small'. LOL! I think I was wrong. They are not 1206. They are about 1.5mm long (with solder), perhaps 0603. They may be 0402 even. Yes, 1206 are pretty easy to deal with. it's funny because I bough the exact same Extron model for exactly the same purpose... several years ago... But mine was broken: the inductor of the embedded DC-DC converter was damaged, and I never had a chance to fix it. For now I'll try to keep the 75ohm output impedance as is, I'll see if it's problematic or not. How different are your cable lengths in you oscilloscope plot? Mine seems to have about 5-6ns of phase offset, whereas yours is 20ns. Odd. I don't remember what the setup was exactly, but I'm pretty sure the coax where quite the same size. I need to investigate a bit more about this delay, but for now, my tek2445 scope is out of order (the PSU had a major failure, I'm still trying to rescue it, not sure whether I'll manage to do so. I need to open a new thread on the subject, by the way). Meanwhile, I'm waiting for a DS1054Z. Hopefully I'll be able to make better measurements then. The Tek Scopes Yahoo Mailing list is the best thing since sliced bread when it comes to Tek scopes. I recapped and repaired by 2465 with some help form those guys. There are some true experts on there (here too, but those guys really love Tek gear).